Picked clients up at the dock and went and threw for big Gizzards. Caught enough to get started and put out boards and a bobber to run some shallow flats and points on the main channel. 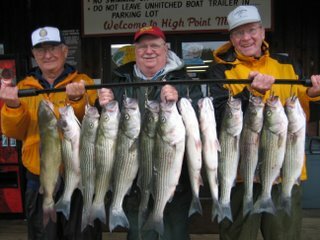 Wasn't but 15 minutes and we started getting hits and the action never slowed down until we ran out of bait at 1 o'clock. Went and caught more bait and went downlake and put out boards over 25' flats with long points coming out to the channel. Had some nice fish here also but the weather turned cold and the guys were ready to go in after raining all day long. We ended up the day having 24 hits catching 12 very nice Stripers and 5 Catfish.